"El Parque" is a private country estate, unique for its natural landscape and idyllic setting in the Ricote Valley, located in the Spanish south east region of Murcia. There are three exclusive “casas rurales” available for rent. The “casa rural” is an official Spanish category of self-catering holiday accommodation in rural environments. The first option we offer is an - art deco style house built in the 1910’s that was usually used as a pavilion for the owner’s guests. The other two accommodations respond to the classical regional housing typology of Murcia, called “casa huertana”. All three have been restored respecting their original structure and charm but adapted to present living requirements: nice and comfortable living rooms and bedrooms, beautiful fitted kitchens, original features and well tended kept terrace gardens that are part of the natural landscape of the estate. The country estate “El Parque” is a 150-acre farm spot of extraordinary beauty and magnificent environmental value provided with a private access and numerous free walking paths to enjoy its very different landscape atmospheres. 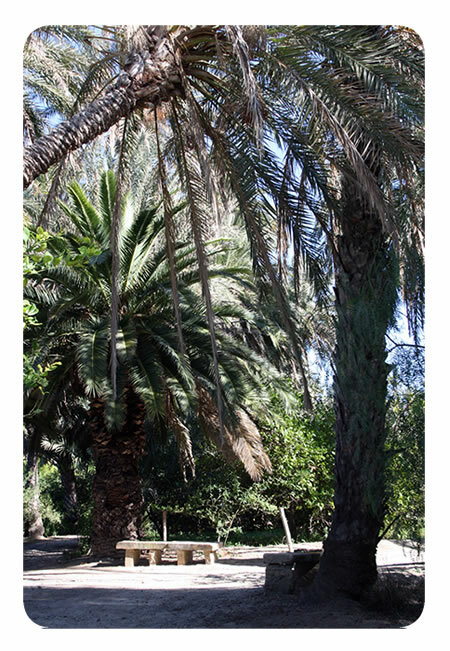 The Levantine orchard garden of orange, lemon, grapefruit and tangerine trees together with fig and pomegranate trees is organized in grids surrounded by palm tress (lots of them centenarian) and cypresses. In the orchards, green vegetables such as broccoli and artichokes are sown. All these orchards are connected by rosebushes paths and intersections with decorative benches, sculptures and flowerpots. A complete different landscape is available along the bank of the river Segura, where we find a wilder diversity of vegetation such as eucalyptus, poplar, elm, willow and pine trees and again more palm trees. And finally the third kind of scenery where big rocks with caves leave space for cactus, agaves, carob and pine trees. This area no matter its aridity and dryness is still beautiful and special as an exotic and far-away land. This gardened estate has a beautiful stately house that was built at the end of the nineteenth century following the aristocratic fashion of that period. It is ochre coloured, has English wooden windows and two beautiful Bougainvillea climbing up the façade into the roof covered with the local type of tiles black aged.